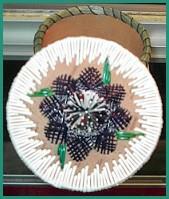 Porcupine quilling is an ancient Native American art used particularly among East Coast and Plains tribes. Indian quillwork involved softening and dying stiff porcupine quills and weaving them onto leather or birchbark. The most stunning examples of porcupine quill artistry were the Plains Indian war shirts, each of which would take a skilled quillworker more than a year to embroider. Medicine bags, moccasins, jewelry, birchbark boxes, and baskets were other crafts frequently quilled in the past. Today, Native American quillwork embroidery is nearly a lost art. Porcupine quills are difficult to work with, and quilled leather is more difficult to take care of than beaded leather. Most quillers switched to beadwork when seed beads became widely available, since beading uses many of the same skills as quilling but is less grueling. However, some native artists are working to maintain traditional quill art today, particularly among the Chippewa and Micmac tribes, where the crafting of birchbark quill boxes never completely died out. If you are looking to buy quillwork that was actually made by Native Americans--either because it's important to you to have the real thing or because you want to support native people with your purchase--then here is our list of American Indian artists whose quilling is available online. If you have a website of Native American quillwork to add to this list, let us know. We gladly advertise any individual native artist or native-owned art store here free of charge, provided that all quill work was made by tribally recognized American Indian, Inuit, or First Nations artists. On our main site we do our best to avoid slowing down our page loading with graphics, but this page is about art, so we'd really be remiss in not showing a few representative quillwork pictures. All photos are the property of their respective artists; please visit their sites to see their work in more depth. You will not find quillwork embroidered war shirts or bandolier bags today unless you are in a museum or viewing an Indian friend's cherished family heirloom; as far as I know no one is still making these items in the original way anymore. 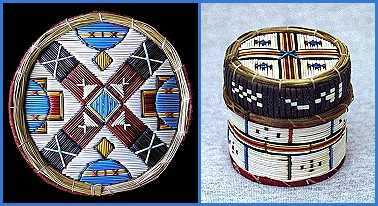 However, traditional American Indian quillwork is still used by some native artists, mostly the Ojibway, to decorate birchbark boxes or baskets. Be very careful of fakes--porcupine quillwork is expensive, and there are a lot of non-native crafters out there making imitations out of plastic or by gluing quills onto a box instead of interweaving them. Here are some places where you can buy a real Native American quillbox today. This Canadian store sells beautiful quilled baskets made by Ojibwa Indian artists. 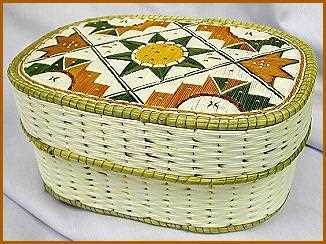 Quillwork boxes woven by the Pangowish family of Ojibway (Chippewa) artists. The French called the Mi'kmaq people "Porcupine Indians" because of their skill at quillwork. Here are some quill boxes made by a modern Mikmaq artist. You can see some of his newer work at this website. This First Nations-owned craft store carries quilled birchbark boxes by Ojibway artists. Porcupine quills have been a traditional component of Native American beaded jewelry since prehistoric times, particularly in the eastern, northern, and Plains Indian tribes. This practice is much less arduous than weaving with quills and the result is much less expensive, though still very distinctive looking. This Mohawk woman handmakes bead and quill jewelry. Most of her work is by commission only. 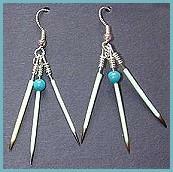 Contemporary American Indian jewelry by a Cheyenne silversmith, including some quillwork pieces. Beautiful book about traditional Indian quill art, with many photographs. How-to guide to traditional porcupine quillwork, from quill collection techniques through different tribal patterns. Outstanding exploration of Plains Indian quillwork, beadwork, clothing and culture. Many photographs. Beautiful book showcasing porcupine quillwork and beadwork from different tribes. A good book on American Indian art history in general, from ancient times to today. 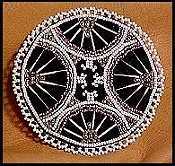 NativeTech Quillwork: Articles and photographs of American Indian quillwork. Sacred Seeds: Native American Beadwork: Tons of information, photo galleries, and how-to articles on bead and quill embroidery. Native American Beads and Beadwork: Article by a Lakota author about native beading and quilling arts in different North American tribes. About us: This website belongs to Native Languages of the Americas, a nonprofit organization dedicated to preserving and promoting endangered Native American languages. We are not artists ourselves, so if you are interested in buying some of the artwork featured on this page, please contact the quillers directly. Though we have featured only Native American quillwork identified with the name and tribal affiliation of each artist, we haven't called the tribal offices to check up on any of them, and we only know a few of them personally. We also don't guarantee any of their products. 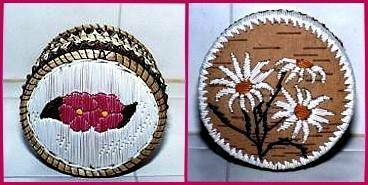 This is not an exhaustive list of American Indian porcupine quillwork--if you would like us to add your quilling crafts to this page, please contact us with your URL and tribal affiliation. We advertise any individual native artist or native-owned art business here free of charge. We do not link to quillwork which is not made by tribally recognized American Indian, Inuit, or First Nations artists, so please do not ask us to. And finally, websites do occasionally expire and change hands, so use your common sense and this general rule of thumb: if the creator of each individual artwork is not identified by name and specific tribe, you are probably not looking at genuine American Indian quilling.